This sweater was designed as an anniversary gift. Our second anniversary was approaching and the traditional gift is cotton. My husband wanted a cable knit sweater, and no other kind. My cable knowledge was very limited so existing patterns would not do. As a result, this sweater was designed. The pattern is a basic cable rib with a roll neck. Because of the ribbed pattern, there is no ribbing done at the hem or sleeve ends. 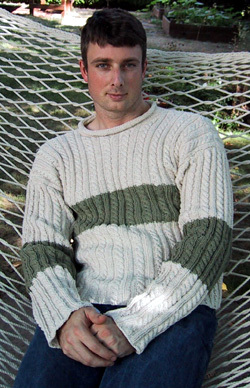 This adds to the relaxed look and feel of the sweater. There are also a few techniques used that may seem unconventional, but all are based on a common-sense approach to knitting. C4F: Slip the next 2 sts on to cable needle and hold in front of work. K2 sts from the left needle. K 2 sts from the cable needle. Row 1: [ws] p2 selvedge sts *p2, k2, p4, k2* Repeat ** 10 (11,12) times. p2 selvedge sts. Row 2: [rs] k2 selvedge sts *p2, k4, p2, k2* Repeat ** 10 (11,12) times. k2 selvedge sts. Row 3: [ws] p2 selvedge sts *p2, k2, p4, k2* Repeat ** 10 (11,12) times. p2 selvedge sts. Row 4: [rs] k2 selvedge sts. *p2 C4F, p2, k2* Repeat ** 10 (11,12) times. k2 selvedge sts. Repeat this four row pattern for 62 (65, 68) rows or until piece measures 9 (9.25, 9.75) inches long. Start the next row in CC, same pattern. Work for 30 (31, 32) more rows or until piece measures 13 (13.75, 14.25) inches long. Return to MC and work an additional 62 (65, 68) rows or until back measures full 22 (23, 24) inches. Work in pattern using MC for 154 (161, 168) rows or until back measures 22 (23, 24) inches. Transfer all sts onto a stitch holder. CO 104 (114, 124) sts in MC as for back. Work as for back, placing contrasting stripe in same place as back. After returning to MC from CC, work 43 (45, 47) rows or 6.25 (6.5, 6.75) inches in pattern. Note: you'll need a spare circular needle for this step. Instead of binding off the neckline, this pattern holds the worked stitches on a spare needle to be worked into the neckline later. This avoids both binding off edges and later picking up stitches on the bound-off edges. Work first 44 (48, 53) sts in pattern, work 16 (18, 18) sts and place onto spare needle; continue in pattern on main needle. Working both sides at once, work across 44 (48, 53) sts. Join new yarn at far neck edge. Work first 3 sts on far neck edge with spare needle. Continue to end in pattern on main needle. Work back across 41 (45, 50) sts. On far neck edge, work 3 sts with spare needle. Work across 41 (45, 50) sts. Work 2 sts on far neck edge with spare needle and continue to end in pattern. Work across 39 (43, 48) sts. Work 2 sts on far neck edge with spare needle in pattern and continue to end in pattern. DEC 1 st at each neck edge every other row 4 (5, 5) times. Work even until piece measures same as back. 26 (28, 28) sts from neck remain on spare needle. In the same fashion as the neckline, the back and shoulders are not bound off until the 3-needle bind off which both joins the front and back at shoulders and binds off the shoulder stitches at the same time. Place sts from holder for back onto needle. Place right sides of front and back together and connect first shoulder using the 3-needle bind off. BO 35 (38, 43) sts. Place next 34 (38, 38) sts onto spare needle for neckline. Connect second shoulder using the 3-needle bind off. Pick up sts on edges of neck so there are about 78 (86, 88) sts around neck. Work 16 rows in st st [k every row in the round]. BO around neck and weave in ends. CO 114 (118, 120) sts using a stretchy cast on. Begin in pattern as for front and back of sweater [will end in a partial pattern repeat]. DEC 1 st at each side every 5th row 27 (28, 29) times. Repeat the 4-row pattern for 43 [46, 48) rows or until piece measures 6.25 (6.5, 6.75) inches. Start the next row in CC, continuing pattern. Work for 42 (44, 45) rows or until piece measures 12 (12.75, 13.25) inches. Return to MC and work an additional 55 (57, 59) rows or until sleeve measures full 20 (21, 21.75) inches. Work in pattern using MC for 140 (147, 152) rows or until sleeve measures 20 (21, 21.75) inches. BO last 60 (62, 62) sts in pattern. Block pieces to correct dimensions if necessary. Set sleeves in between CC stripe, or centered at shoulder. With right sides together, sew each sleeve to body. With right sides together, sew up side seams and sleeves. Shetha learned to knit at 8 years old, but didn't start knitting from patterns until January of 2002. She started creating designs before she could read a pattern. Since most of it was math, she was a natural. Her career in a very structured scientific environment creates a need for a creative outlet, and knitting provides that outlet. pattern & images © Shetha Nolke. Contact Shetha.